Please refer to our stock # 1675 when inquiring. 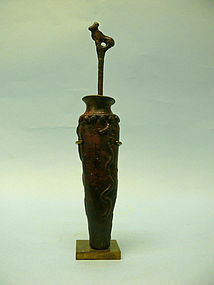 Luristan Bronze Cosmetic Bottle and Applicator, ca. 1st Millennium BCE. Found in Israel. Motif of Serpant on bottle with a ram or goat figure on top of applicator. Nice brown patina due to age. 7 1/2" from base to tip of applicator. Vessel is 4 1/2" high x 1 1/2" wide x 1" deep. Applicator stick is 5 3/4" long. In excellent condition. According to the Iraniciaonline.org, BRONZES OF LURISTAN, the accepted term for a distinct body of metalwork produced in the first half of the first millennium B.C. and characterized by a wide range of idiosyncratic forms and a highly stylized conception of human and animal representation. These bronzes are to be distinguished from material excavated in Luristan but belonging to earlier periods and from material incorrectly attributed to Luristan. Typical categories of canonical Luristan bronze artifacts in­clude cast animal finials, standards with masters of animals, horse cheekpieces, and harness attachments in the form of naturalistic or fantastic creatures, figured and disc pins, whetstone handles, and bracelets. Among the weapons are swords, daggers, axes, maces, quivers, and halberds. Both casting and repoussé techniques were employed. Among the highly stylized human and animal forms the zoomorphic juncture plays an important part, especially on pins, bracelets, and weapons (for more detailed description and discussion of the characteristics of Luristan bronzes, see Vanden Berghe, 1968, pp. 149ff., figs. 6, 8, 9, 11-14; Muscarella, 1988b, pp. 114f. ).